These easy tips for planting sweet corn in your backyard vegetable garden will ensure a bountiful harvest every year! 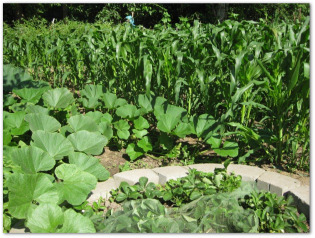 Learn how to plant, grow, water, and harvest sweet corn plants when vegetable gardening. When planting corn, make certain the soil is not too loose. Plant the seed corn kernals 1 to 1 1/2 inches deep. Firm the ground by stepping on it lightly after you have planted 3-4 corn kernels per hill. Avoid sowing corn seeds too deep because it forces the young seedlings to struggle their way to the surface, which depletes vital energy they need to grow and thrive. In early spring, you can try an old gardener's trick by putting your bare elbow down to the ground to determine if the soil is too cold for planting sweet corn. If you want to make a nice straight seed trench before planting sweet corn, use an old broom handle. Lay it flat and tread it into the earth. Apply well-aged manure two weeks prior to planting sweet corn. Leave a distance between plants of 15 inches. Space rows 2 ½ feet apart. Average maturity is 80- 90 days. An expected yield from a 100 foot row is 50 ears of corn. 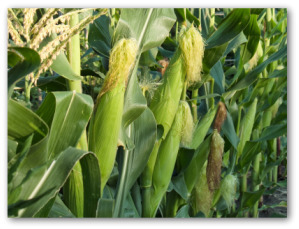 A big garden plot is the best place for growing sweet corn, although it isn't impossible if you have only 30 by 30 feet. 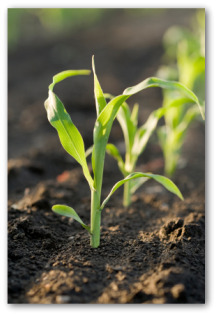 Corn should always be planted in blocks of at least three rows of the same variety in order for pollination to occur! Corn plants are generally robust and quite adaptable. An occasional bit of dry weather may even be to their benefit in encouraging roots to dig deeper in search of moisture, thereby making them stronger. 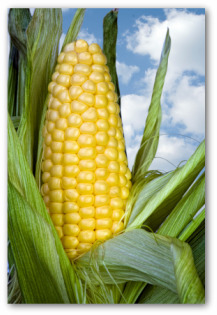 Corn can deplete the soil of essential nutrients. Fertilizer, particularly one rich in nitrogen, should be used liberally. A winter crop of clover is ideal for the corn patch. Mulching is always a worthwhile exercise in the cornfield. 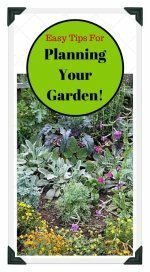 To avoid compacting the earth in a vegetable plot without implementing stepping stones or pathways, walk along old wood planks laid down between the rows so that your weight is spread across a larger area, causing less damage. Feed the soil around the plant so that its roots absorb the nutrients. Don't fertilize at the foot of the stem, as this encourages "soft" growth, which makes the plants susceptible to pests and diseases. 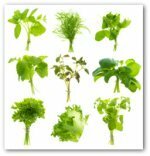 It is a regrettable truth that the better quality of the soil, the bigger and more productive the weeds. Hoe gently because the seeds from weeds will germinate again if you dig up too much soil and bury them in the process. 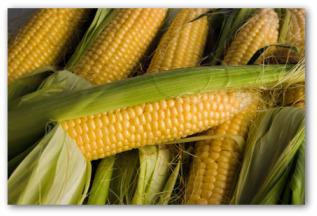 Sweet corn should be harvested in the milk stage, at the last possible minute before dinner because the sugar content rapidly decreases from the moment it is picked. Break a kernel with your fingernail; if the inside is milky liquid, it is ready for picking. Harvesting early, before the kernels reach the dough stage, is especially important if there are many crows in your area. Birds can be a major problem in vegetable gardening. 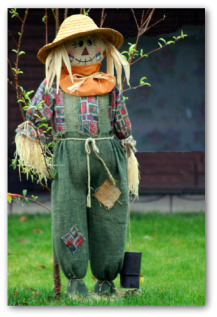 Borrow a trick that farmers have used for centuries by making a scarecrow to deter the pests. For the scarecrow's body, make the shape of a cross by tying together two poles. Dig some old clothes out of your closet and dress the scarecrow in any fashion you choose. For the head, stuff an old T-shirt with cloth, held together with safety pins. Draw on face with a permanent felt-tip markers. Stuff the scarecrow with straw or discarded rags and put a straw hat on its head.